The Year of Cheese is in full swing over here in Philly. And, though I’ve been writing somewhat less (grad school coupled with a DSLR in dire need of repair is a lethal combination for blogging), it’s not for lack of eating delicious things and drinking incredible beers. However, I did round up an old point n’ shoot (is that what the kids still call these non-fancy cameras?) 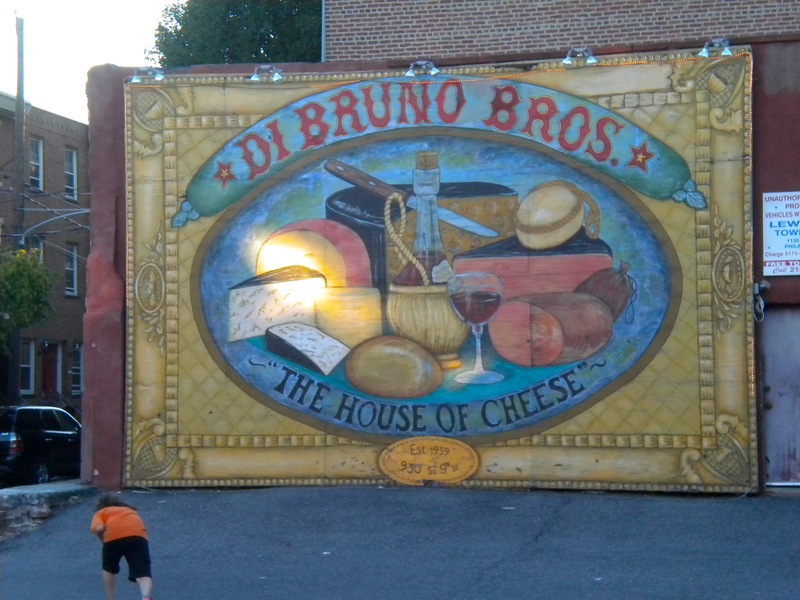 because in honor of my 26th birthday (and, of course, the Year of Cheese), I decided to celebrate with eight close friends at none other than Di Bruno Brothers’ Italian Market location for our very own After Hours party. Hey, kid. quit throwing balls at my photo subject! In case you aren’t aware, Di Bruno Brothers is basically a mecca for cheese lovers (or food lovers, wine lovers, Italian lovers, and even just a pair of actual lovers who want a set of romantic treats to eat). 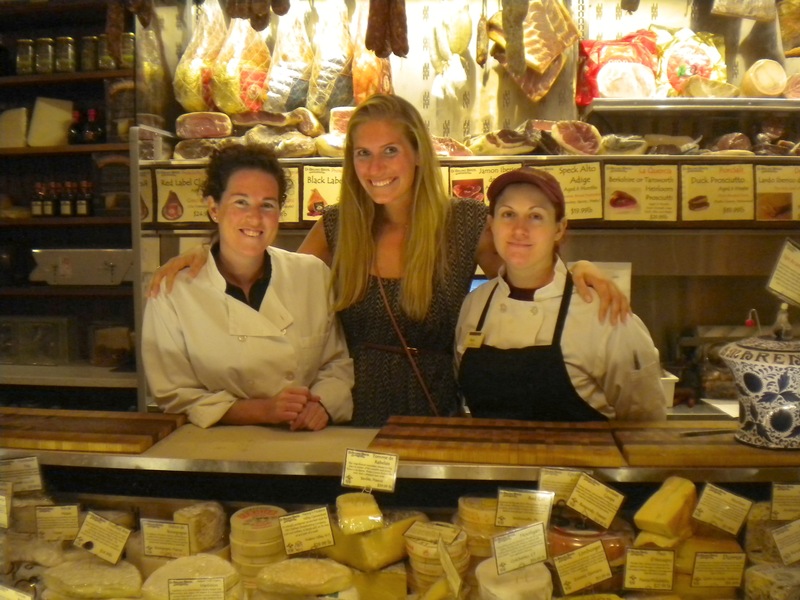 It’s been my go-to spot for exploring new cheese and the cheese mongers KNOW THEIR STUFF. And, if you’re a foodie who has at least 7 friends (or can find 7 strangers who have some dollars to spend on a culinary adventures), you can hit up DB’s Italian Market location for a most incredible evening. Here are the deets: For two hours, from 7pm-9pm, after the store has closed, you and your 7 buddies (you can add more if you’d like, though it’s a small store so I wouldn’t push it too far) can grab any beverages you want (we went with wine and beer) and are invited on a cheese and cured meats tour de force presented by the mongers. You can sample cheeses that aren’t on the prescribed cheese journey, but pace yourself because the samples may seem small, but the richness is big, and the flavors go hard on the tongue. Clearly, I was not excited at all. The epicurean excursion begins with a cheese spread (a very spicy one initially) while your guests arrive. You can explore the diverse racks of ingredients and items and think of what you’re going to buy (and I say this because you’re definitely going to buy something. You get a 10% discount on everything you purchase that night, so choose wisely.) And the best part is, other people will try to enter the store. For that night, the store is ALL YOURS! After the spread, you face another spread. 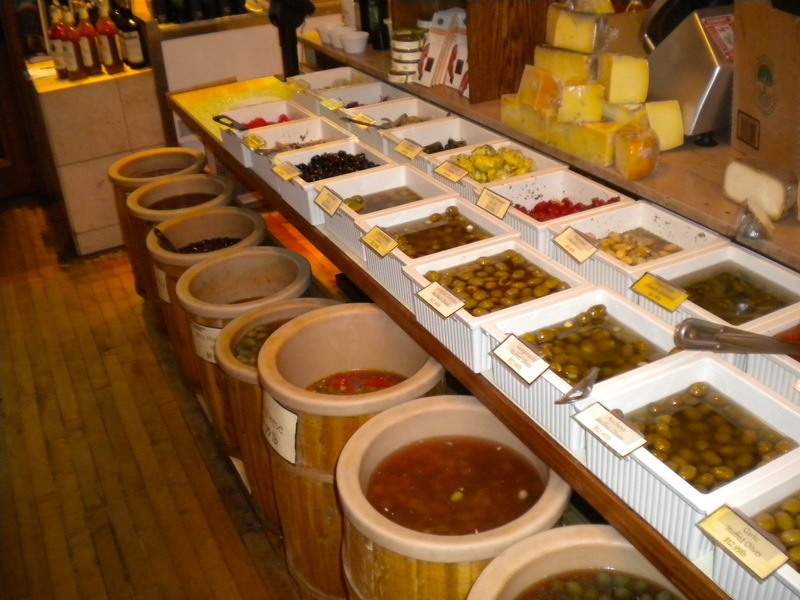 That spread is any and every olive imaginable. Stuffed with everything from gorgonzola to feta to peppers to prosciutto. I wouldn’t call myself an olive fan…. that was before my night at DB Brothers. 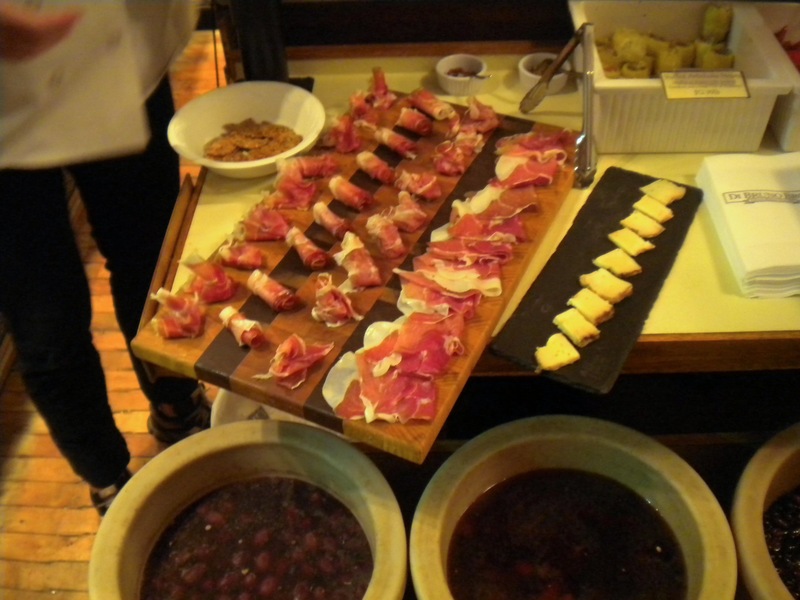 My personal favorites were the gorgonzola stuffed and the peppers stuffed with provolone and prosciutto. But honestly, it all was incredible. And then, the formal tasting began. What could be more formal than a ball of burrata? Pour some SUGAH (er… salt) on me! 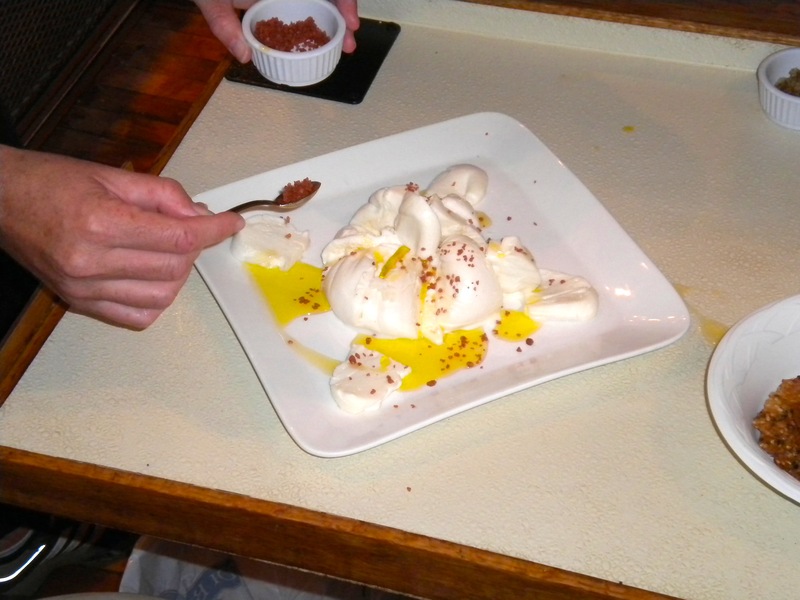 Oh, just a ball of burrata drizzled with the fanciest olive oil known to mankind and sprinkled with this insane red (lava?) salt. I may have had my fair share (and two other people’s share) of this. Incredible. This evening made me a little greedy. 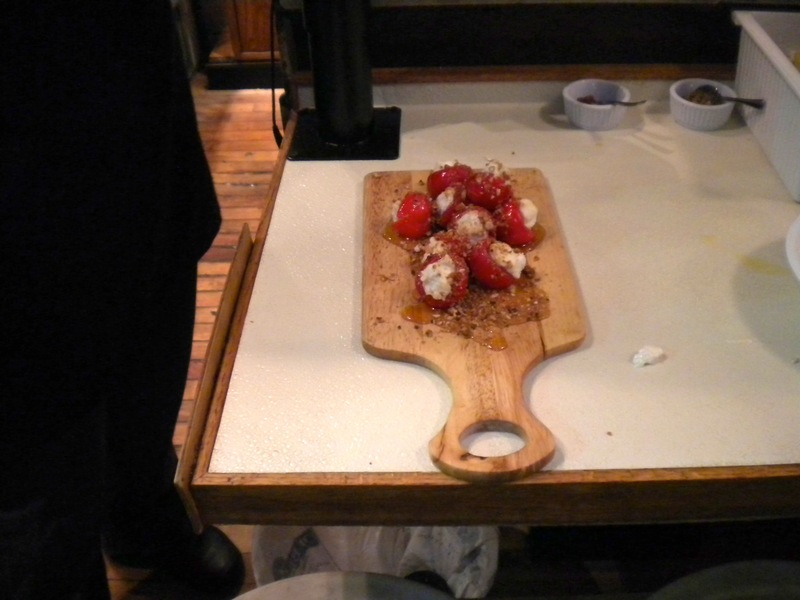 Next, our mongers jammed some peppadew peppers with Capricho de Cabra, an unreal goat cheese, then drizzled the whole thing with chestnut honey and sprinkled with DB’s infamous Black Lava Cashews. That may sound like an aggressive description for an appetizer. Well, it was an aggressive flavor explosion. Ever imagine what it’s like to have someone present you with not one, not two, not three, BUT FOUR different prosciutto options? 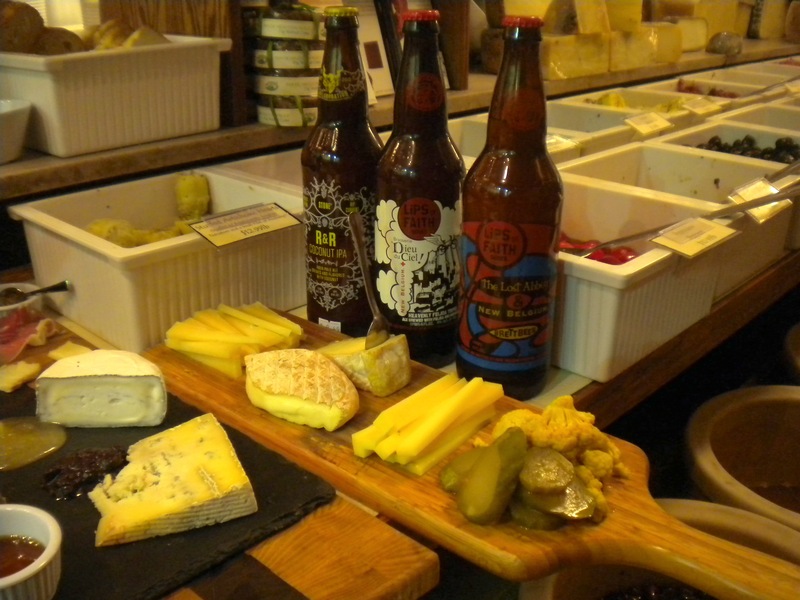 And then, the mistresses of mongers laid out my favorite platter: The beer and cheese pairing party! Stone and Rip Current’s Coconut IPA paired with an awesome cheddar that the monger failed to write down for me, RATS! The IPA, though not at ALL coconutty, cut nicely through the cheddar. I wish I could tell you what it was, but the mystery remains. All I know is that the mouthful of curried cauliflower, cheddar, and IPA was on POINT. 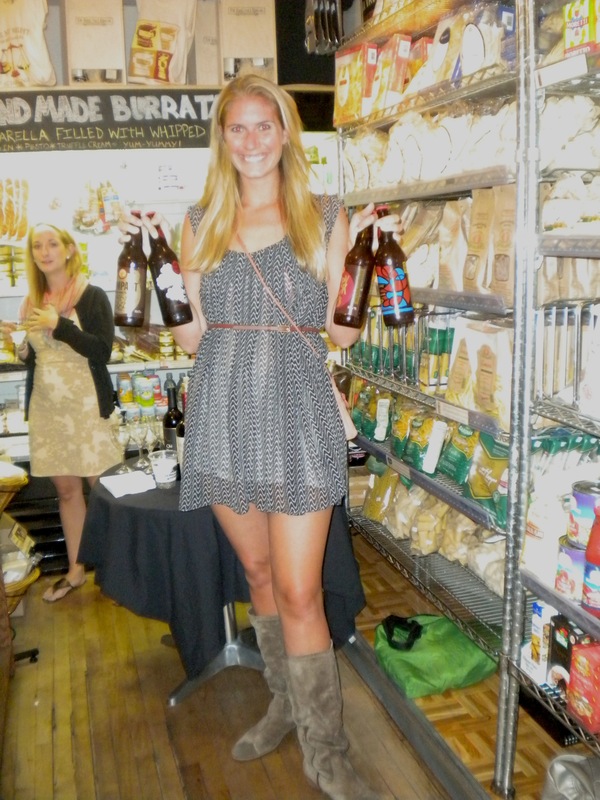 I don’t think I loved this beer alone, but with the mixture of flavors…. I’m into it. I will lead the next one with the a recognition that I do not like Belgian Trippels, as a general rule. 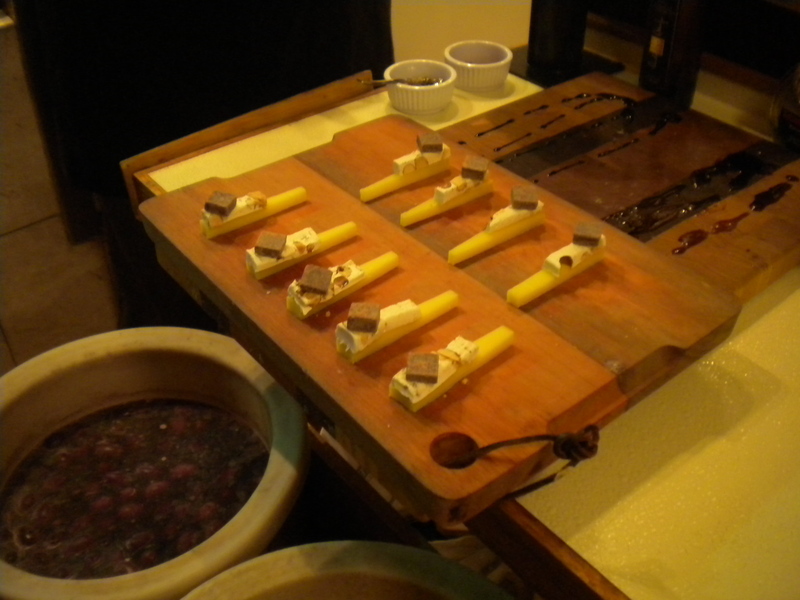 But paired with the washed rind, semi-soft butteriness of the Willoughby, and my mind was changed. I shall submit to future trippels as long as there’s a spreadable cheese nearby. Unfortunately, the Brett Beer was underwhelming and I ended up liking the cheese far more than the beer. Nutty and dry, with a little sharpness, this cheese was easily accessible and DELISH. The beer…. was forgettable. The combination of two of my favorite edibles on the planet: s’mores and CHEESE! Namely, Scharf Maxx 364, a tangy, sharp swiss, paired with dark chocolate and Italian Torrone. Obviously, I hated every second and had a terrible time. But, real talk, I would do this again in a heartbeat. It worked out to be about $50 per person, and we each came away with a Di Bruno reusable tote, full bellies, a take-home treat (each person’s was different) and 10% discount on all the goodies we picked up that night. That, to me, feels like a deal. Yes, the Year of Cheese continues strong. So, it’s official, Philly. I’ve been a resident for the past 13 months. That means a sweltering summer, a freezing fall, an unbearably cold (relative to Carolina) winter. Whole athletic seasons (which I’ve paid little to no attention to) have come and gone. I’ve seen the Mummers (and danced with a few), eaten dollar dogs, brunched at Honey’s, and spent many an afternoon in the sunshine at Rittenhouse Square. I feel confident that I could find something fun to do basically any hour of any day, and whether it’s a festival, a pop-up restaurant collaboration, a beer pairing, or a performance, I’ve enjoyed a TON of what Philly has to offer. Don’t worry, I’m still hungry for more. An easy way to remember this site is it’s Food and Booze News in Philly. It tends to be my go-to for most of the events I’ve enjoyed the most, but that’s because eating and drinking is my favorite way to spend my “fun money”. New restaurant openings, food truck festivals, drink recommendations, and free stuff. That’s right, FREE STUFF Y’ALL! Keep that college student mentality going for LIFE! Be Well Philly for when you’ve stuffed yourself with all that food and booze..
Because we can’t just eat and drink ourselves into a stupor all day, every day. Right? Outdoor yoga festivals, deals on spin class, master group fitness classes, the best places to get gluten-free desserts (luckily, I don’t need or want that. but someone might. ), interesting running events throughout the city, and new gyms that are opening in your neighborhood! If you’re a fan of crowd-sourcing judgment on all of the places to eat, drink, and be merry (as well as who gives the best haircuts, who is the most responsive property management group, and where to find late night groceries), Yelp is the obvious answer for any and all cities. But I’ll go ahead and say that Philly not only has an incredibly active Yelp community (check out the “talk” for laughs and insight alike), but our Community Manager, Michelle, is the queen of Philly Phun. Follow her on Twitter for all things Philadelphia. You won’t regret it. Philly from the inside out? I can get behind that. They sometimes organize posts by neighborhood, which is always appreciated as someone who’s very loyal to a few particular locales (especially those reachable by the MFL). Upcoming events for young and old, this is a super family-friendly site with something for everyone. Their weekend lineups are probably the most comprehensive ones I’ve found, and a great way to find something to do every single day of your respite from work. Thrillist Philly: Much less family-friendly. Because sometimes, you don’t wanna know where to bring your nephew for an Easter Egg hunt. You wanna know where to find burlesque and bourbon, tequila and tacos, naked bike rides and the best water slides. Thrillist is basically a grownup playground in a website. Food is fun, festivals too. But sometimes, you just wanna drink. Luckily, there’s a site for that. Drink Philly has pulled together all the city’s best happy hours and drink specials in a matrix that is both searchable and filter-able. Search by neighborhood, time of day, type of special, whatever. 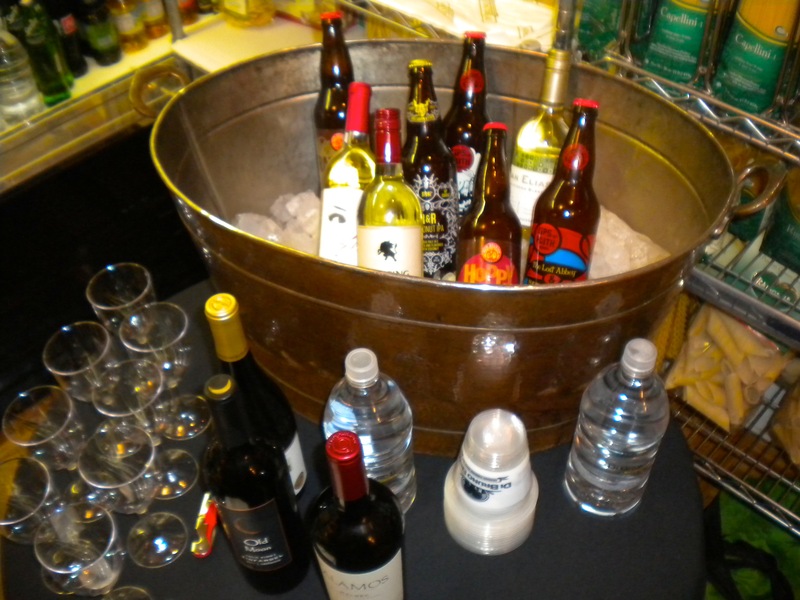 Get the best deals on your booze all day long!! And they also regularly post about Brew and Chews, beer fests, First Friday specials, and other interesting alcohol-related tidbits. I guess this one also isn’t very good for kids. ANYWAY, feel free to check out my Twitter List if you’d like to follow each and every one of these folks on twitter. This has proved the fastest, easiest way to stay abreast of Philly Fun, at least for this chick. AND, if you have any suggestions, lemme know! I’m always down to check out a new blog/site to stay in the loop.